Here it is . 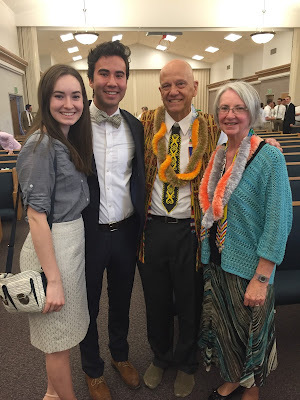 . . the final chapter of my missionary blog. It’s been a long time in coming. We’ve been home a little over a month now. We have been busy since returning home and have had very little time and/or energy to sit down and write this final chapter. It's also a hard thing to do as I think back about the last 18 months . . . the ups, the downs, the members, the missionaries, the food, and all the other experiences that we've had . . . they are over for now, and my heart o'erfloweth. We arrived in Salt Lake City on March 1 in the afternoon. We were met by our three children and their families at the airport. We spent the evening with them and stayed that night with our son, Aaron and his family, in Grantsville. The next day we flew to St. George where we were met by our other two children and their families. It was definitely a wonderful reunion to see our children and our grandchildren again. We've missed them a great deal. We also got to meet two grandsons that we hadn't met yet; Pierson who is about 18 months now and Ezra who is about two months old. Such handsome, happy little guys. It is a blessing to hug them and to receive hugs from all the grandchildren, all 21 of them! Welcome home to St. George! All the homemade signs, here and in SLC were fantastic! Definitely a welcome sight to see all our grandkids again! We have been going ever since we've arrived back in St. George. We've made several trips to various stores to restock and update our home and yard supplies. We went to the Spring Home and Garden Show in St. George and came away with several ideas. Today is the first day of Spring so our thoughts are turned to sprucing up the yard, at least getting a bit of a garden planted. But, that's not important. I need to get back to more important matters. 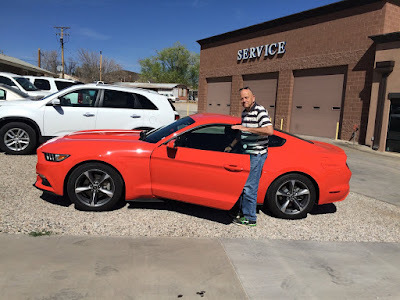 One important stop when we got back to St. George was to rent a car. We gave both of our cars to our sons when we left. Both cars promptly broke down shortly after we left. SIGH! They both have yet to be repaired. So, the rental? The picture speaks for itself. It was fun to drive, but a little impractical for us! No, we didn't buy that one. We were a little more conservative and bought a used 2015 Hyundai Santa Fe. It fits our needs at the present time. It gets really good gas mileage! Our homecoming Sacrament meeting was March 13. The ward has grown a lot since we've been gone, partly due to a long overdue ward boundary change. Anyway, the chapel and overflow were filled to capacity. We had a lot of family, friends, missionaries, and parents of missionaries. It was overwhelming to have so many people show their support for us. The musical number was presented by our children, grandchildren, and many of the missionaries that we have come to know and love. Sherrie accompanied on the piano; our granddaughter, Savanna, accompanied on the harp; and I directed. We sang I Am a Child of God in English and Malay (Aku Anak Tuhan). It turned our very nicely. A special thanks to Brother C for videoing part of the musical number! After the meeting we met at our house for a light lunch and some visiting. I should note that the Saturday night before we had a little missionary reunion. Several of our missionaries were able to stop by and visit. It was wonderful to have this opportunity to renew these friendships. Beth and Micah Putnam. Micah was our language tutor. Elder Orr's mother and siblings. In our backyard with "our adopted sons. One of the major things I wanted to do when I go home was to get back on my bike and lose some weight. It took awhile . . . maybe three weeks, before I could even think about it, but it finally happened. We took both Sherrie's and my bike in to be tuned up. They were in sad shape, but they looked and performed almost like new after the tune ups. I had to replace both tubes on my bike before I could ride. Before we left on our mission I was up to 15 miles per day. It's going to be awhile before I get to that point again. I didn't fare too well on my first two rides, but I am up to the challenge. I will be at it everyday starting next week. This week we are in Salt Lake City for a grandson's birthday. I close my missionary blog by declaring to all who read it that I know the Gospel of Jesus Christ is true. I know He lives. I know The Church of Jesus Christ of Latter-day Saints is His true Church on the earth today. There is truth is all churches, but The Church of Jesus Christ of Latter-day Saints is the only church on the earth today that has His Priesthood, the authority to act in His name, and all that He needs us do and know. The Church was restored through the Prophet Joseph Smith. I know he is the prophet of the restoration. I know our Father in Heaven and Jesus Christ appeared to him in a grove of trees as he knelt in prayer to ask which church he should join. I know that he was told to join no church at that time, but that he would be used as an instrument to restore the ancient Church of Jesus Christ which fell into apostasy when the apostles, the foundation of the Church, were killed. I know that Joseph Smith received the Priesthood from John the Baptist and Peter, James, and John. He received more keys from other ancient prophets. I know the Book of Mormon is true. It was given to him by the Angel Moroni. Joseph Smith translated by the power of the Holy Ghost. I have read the Book of Mormon several times. I know it's true. I know that our Father in Heaven has provided a way for us to return to Him. It's called by many names, but perhaps the most common is the Plan of Happiness. Through His plan, we have been blessed with a Savior, even Jesus Christ. I know that through His Atonement we can return to live with Him and with our Father if we repent, keep trying, and endure to the end. I am grateful that we had the opportunity and privilege to go to the Singapore Mission and work with the seminary and institute teachers in Sarawak, East Malaysia. I am grateful for them and their dedication and examples of the Gospel of Jesus Christ for the youth with whom they work. I am grateful that we had the privilege of working with them. 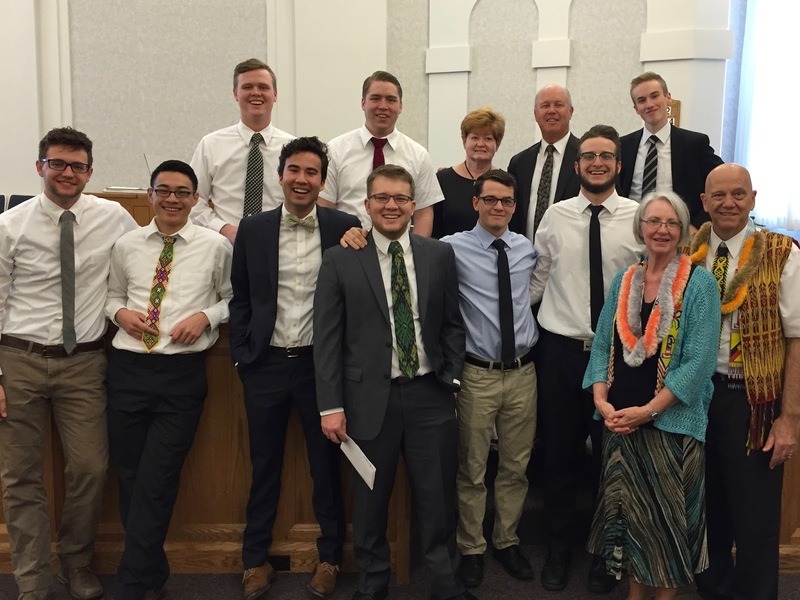 I am grateful for the members and the missionaries with whom we grew to love with all our hearts. We were greatly blessed by so many beautiful and wonderful people. We already miss them a great deal. I am still having withdrawals. I know that we have a living prophet today, even Thomas S. Monson. I know that we have living apostles, too. I know that the organization of The Church of Jesus Christ of Latter-day Saints is led by Jesus Christ. I know that we served a purpose on our mission. I know that we were able to help and influence others for good. We were able to organize a seminary council in Sibu with youth from several branches of the Church there. 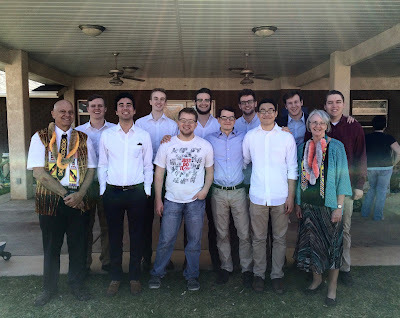 We were able to help teach members about the Gospel through the seminary and institute programs, the Primary program, and music. We taught a directing class which turned into the Branch 2 Choir. It is still going strong. It has been a blessing for us to be able to serve and share. I love the Lord. I love being in His service. We would like to serve another mission. We will see how our health and family go. The Church is true! I thank my Father in Heaven for calling us to serve.